The stamp's central motif, a portrait of Andrew Jackson, was designed and line engraved on steel by John Halpin. It was then transferred to a steel die. 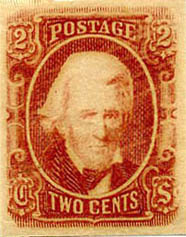 It is a full-face view of Jackson modified from the vignette of the U.S. 2-cent "Black Jack" stamp of 1863, and is sometimes referred to as the "Red Jack". Based on incomplete records, it is estimated that there were 1,636,000 stamps printed from a two hundred-subject steel plate divided into panes of one hundred by a vertical gutter. Plating is incomplete as full sheets remain. These imperforate stamps were printed on white wove paper of varying thickness and with colorless gum. The first printing was a soft pale rose shade almost chalky in appearance; the second printings were in brown-red of varying shades. There are two recognized double transfers as well as other minor varieties. The earliest recorded date of use is April 21, 1863. This issue was most often used to pay the two-cent drop letter and circular rates - less frequently, strips of five stamps paid the ten-cent letter rate. The two printings of the 2¢ engraved stamp can now be scientifically identified by paper type as of 2012. Harry G. Brittain, PhD, FRSC, published his ground breaking scientific research series in The Confederate Philatelist, quarterly journal of the Confederate Stamp Alliance, in 2013. For many years, it was believed that John's Halpin's brother Frederick had engraved these stamps but, in 2015, Halpin descendant Jeffrey Hawkins proved that it was Frederick's brother John (both were engravers) who engraved the stamps. The story of these two brothers was published in The Confederate Philatelist, the journal of the Confederate Stamp Alliance. The publications of August Dietz from 1929 through 1986 had the incorrect information, as does the 2012 CSA Catalog, as the new information had not yet come to light at the time it was published.